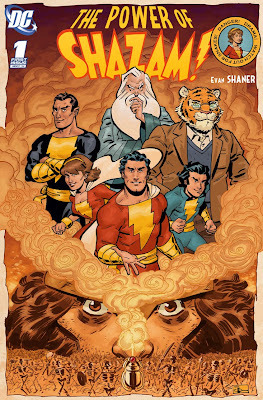 This is a follow-up to this mock cover, my idea being that after 12 issues of Cap by himself in The Magic of Shazam!, I'd start over with The Power of Shazam! and bring in the rest of the family. The first arc would see them take on the reawakened King Kull and his Army of the Undead. I agree, it's beautiful! How has DC NOT gotten you to do this yet?! Really damn cool. I think this is a much more successful cover than your fifty-too one. Great concept and very well designed. I would buy the hell out of this book. Thanks guys! Yeah Ron, I feel a lot more confident about this one. "Gorgeous" is definitely the word for that. I love how eager Captain Marvel looks, you definitely see the kid in him. SHAZAM! Hey comictwart - you have a great blog. Listen my fellow comic book enthusiast, when you have a moment to spare, check out my site - http://www.comicbookandmoviereviews.com/ - as I would like to know your opinion on my wares. Follow - like - digg - or tweet - whatever is good with you is great with me. All the best buddy, and keep on blogging. Whoever is in charge at DC needs to be replaced by somebody who could make this happen. That, I would read ! احصل علي خدمات من افضل توكيلات الصيانة في مصر من صيانة كاريير المتخصصه في صيانة جميع انواع التكييفات والتي تتم علي ايدي امهر العمال والفنيين . تواصلوا الان مع صيانة وستنجهاوس التي تقدم لكم افضل خدمة علاء علي الاطلاق في جميع انحاء مصر والتي تستطيعون ان تصلوا لها من اي هاتف داخل حدود جمهورية مصر العربية وايضا من خلال صيانة وايت ويل تستطيع ان تحصل علي افضل صيانة من خلال افضل مهندسين صيانة لدينا في مراكز صيانتنا عبر محافظات مصر.